The historic Rheem Theatre in Moraga may have a new lease on life, thanks to four very creative and business-savvy students from the class of 2019. 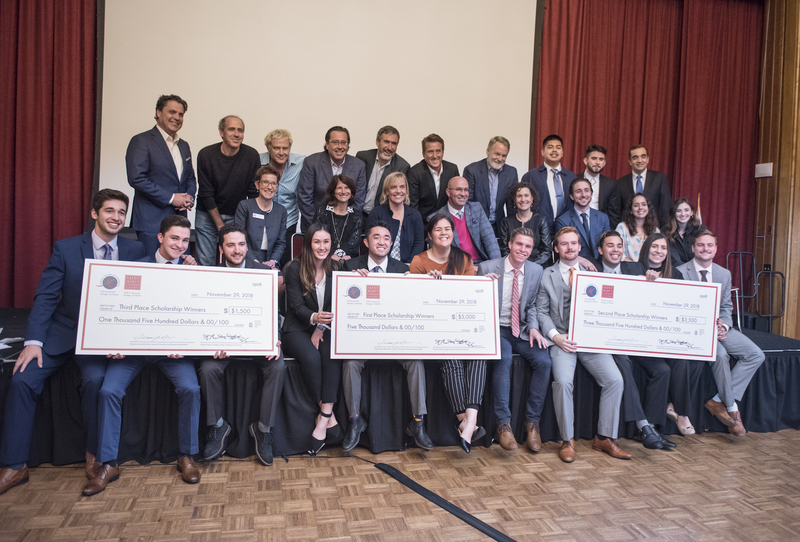 The students made up one of five teams that participated in a challenging business case competition on Thursday, Nov. 29, organized by a joint collaboration between Saint Mary’s and the Moraga Chamber of Commerce. The competition included students from the School of Business Administration (SEBA). As part of their Business Administration Strategy class (BUSAD140) taught by Professor Marco Aponte-Moreno, the students were divided into five teams and assigned a coach to lend guidance as they researched industry trends and engaged in SWOT analysis, revenue and expenditure forecasting, economic forecasts, and creative strategies to develop their 10-year business case for the Rheem Theatre. The capacity-filled room brimmed with supporters from SMC and the Moraga community, eager to see the presentations and ultimately the teams that would place first, second, and third to win the coveted $10,000 in scholarships. After a bit of socializing and nibbling on tasty hors-d'oeuvres, the 12 judges representing a cross-section of high-level business executives settled into their seats and prepared to rate each presentation. They included: Cynthia Battenberg, town manager, Moraga; Kristin Connelly, president & CEO, East Bay Leadership Council; Doug Ewert, CEO, Tailor Brands; Tom Frainier, CEO, Semifreddi’s; Peter Gruebele, EVP, Wells Fargo & Company; Tim Hennessey, CEO, PGIM Real Estate; Bruce Kalfus, senior director, Sports Marketing; Jay Kerner, senior director, Sports Marketing; Ben Olson, CEO Compass Residential–Olsen Team; Tom Schnurr, president, Moraga Community Foundation; Shari Simon, CEO, Next Move; and Derek Zemrak, operator, Rheem Theatre. Larisa Genin, associate dean; Yung Jae lee, interim dean; and Margaret Kasimatis, provost, provided the welcome and program overview. The Rheem Theatre challenge was explained by Tom Shepard, a board member with the Moraga Community Foundation and Rheem Theatre Committee. Robert Fritky, president of the Moraga Chamber of Commerce introduced the judges and sponsors. Marco Aponte-Morena, assistant professor with SEBA, initiated the team presentations, and upon the conclusion of the presentation, the winners were announced by Margaret Kasimatis and Dave Trotter, mayor of Moraga. As each team made its way to the stage, a combination of project pride and nervous anticipation took over; but as soon as each began to speak, the nervousness made way for a mix of often compelling ideas and strategies. The teams were evaluated on a rubric with the following criteria: competitive advantage, market need, a potential for success, financial needs, and presentation. The multiple nodding of heads among the judges and attendees signaled that the teams did an excellent job of presenting their business case for the Rheem Theatre. The teams presented a mix of innovative and creative solutions, including movie theater memberships for students and families; partnerships with local schools, upgraded facilities, such as an arcade, bar, and café; bingo nights; speaker series; party bundles; and more. With each alternative suggested, projected financial outcomes revealed opportunities for positive growth over the 10-year period. Drum roll: The winning business case was provided by team 4—who presented the concept of an eSports Arena targeting the Lamorinda community and beyond. The presentation defined eSports as a “…[a] form of competition using video games.” Most commonly, eSports takes the form of organized, multiplayer video game competitions, and is a rapidly growing industry with projected revenues of $655 million in 2017, $906 million in 2018, and $1.65 billion by 2021. Under their plan, patrons would pay by the hour to play from a selection of games, or they can purchase gaming memberships for unlimited play. Team 4 shared that the structure of the theater will not have to be altered and movies would still continue to be offered. When the first through third place winners were announced, oversized checks for the scholarships were handed to the teams, making for perfect photo opportunities. Team 4, comprised of all seniors, was giddy with joy at being announced the grand prize winners. “We worked so hard, but it was fun at the same time,” said Lourdes Hess. The team gave extra kudos to fellow team member Jeremiah Michael, who planted the initial idea of pursuing an eSports strategy. “We took the idea and ran with it,” said Jonathan Chan, who did a lot of work on the financial projections. “Everyone had an important role to play, and it all came together like we wanted. We are truly a team, and we’re so happy that the judges loved our plan,” added Leah Emerson.